American Architectural Foam Works (AAFW) provides quality custom mailboxes to enhance the appearance and value of your property. Our staff of highly trained designers will help you choose the right design for you and your home. Our decorative mailboxes are hand-crafted, fabricated with quality materials yet are lightweight, durable and made to last. 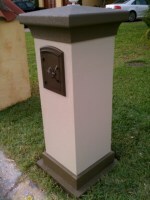 Our custom mailboxes meet the requirements of the USPS. The mailboxes are shipped ready to install, and since they are primarily made of EPS (Expanded Polystyrene) are very lightweight, easy to lift and do not normally require special equipment to handle.